Patrick Stewart (Captain Picard), Jonathan Frakes (Cmdr. Riker), LeVar Burton (Lt. Cmdr. La Forge), Michael Dorn (Lt. Worf), Marina Sirtis (Counselor Troi), Brent Spiner (Lt. Cmdr. Data) and Gates McFadden (Dr. Crusher) will appear throughout the show with various autograph, photo opportunities and an evening with the cast together on stage. Warning: Fan Men and Women, be prepared for the event of a lifetime! For the first time ever in Toronto, the cast of Star Trek: The Next Generation® comes to you live on stage! Toronto ComiCon presented by Fan Expo Canada™ is very excited to bring this dynamic event to the Metro Toronto Convention Centre at 7PM, Saturday, March 9, 2013. The cast will be on stage together sharing stories and recounting tales with celebrity hosts Teddy Wilson, Ajay Fry and Cynthia Loyst from Space. Remember, this is a separate ticketed event and your admission to the Toronto ComiCon does not allow you access to “An evening with the cast of Star Trek: The Next Generation”." There will be many other celebrities coming to ComiCon including Michael Hogan of Battlestar Galactica, Sean Astin from the Lord of the Rings, Laura Vandervoort from Smallville V and Daniel Logan of Star Wars Episode II. Other attractions include live anime game shows (Win, Lose or Draw. Name that tune and Flash), an anime workshop where you can learn how to build your own plushie. 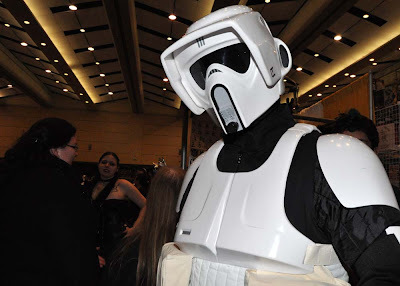 Star Wars characters from the 501st Legion will have a large contingent at the show.